Winner of 10 Academy Awards (including best picture), the second-highest grossing film of 1961, and the production that introduced powerhouse Rita Moreno to a grateful public, West Side Story was released 50 years ago today. Developed from the Broadway musical, which was itself a version of Shakespeare's Romeo and Juliet, the film won high praise from both critics and audiences. This Broadway show turned American musical theater in a new direction. The songs were more complex musically, the dancing was pulled into the forefront of the storytelling and although it was wrapped around the timeless boy-meets-girl storyline, it tackled major social problems such as racism and poverty. Leonard Bernstein rarely wrote lyrics so he only composed the music for the score, leaving the lyrics to a then-unknown composer named Stephen Sondheim who made his Broadway debut. In the book by Arthur Laurents, who died earlier this year, and adapted by Ernest Lehman for the film, the Montagues and the Capulets became the Jets and the Sharks, two rival teenage street gangs. Not only are they at odds over turf, the Sharks are newly arrived Puerto Ricans. The Puerto Ricans suffer the disdain of the Jets, but also suffer discrimination from the police officers Schrank and Krupke. 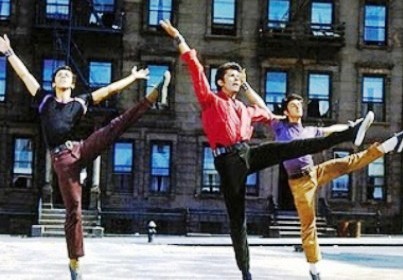 West Side Story opened the door for edgier musical theater when it debuted on Broadway in 1957. The film was long in development, with a number of production and cast misstarts. Robert Wise was hired to direct because of his experience with New York dramas, but due to his inexperience with musicals, Jerome Robbins, choreographer of the Broadway show, was brought on to direct the musical numbers. The No. 1 “get” for Tony always was Elvis Presley. However, Elvis’ people didn’t want him associated with knife fighting. There also were rumors that the previous affair between Natalie Wood and Presley may have affected the decision to turn the role down. Natalie Wood was not even in contention until she read with her then-paramour Warren Beatty during his audition and was cast although Beatty was not. Former child actor Richard Beymer was given the job — even over triple threat Russ Tamblyn, who also had been acting since his early teens who got the role of Riff. The trick in adapting a Broadway musical for film is to open up the world of the show from the space limitations of the stage to the wider world possible on film. The opening shots of the film show actual aerial footage of New York City. The view from above establishes New York as a warren of crowded buildings, gray rooftops and few distinctive features. From this angle, New York’s romance as a world class city is diminished, setting up the world of the working class people of the story. Another good use of the cinematic nature of film is in the “tunnel vision” the two lovers have when they are together. When they meet at the dance, the rest of the world blurs away. They only have eyes for each other. Conventional wisdom holds that the two leads are the weakest part of a fantastic film. Marni Nixon dubbed Maria’s singing parts and Jimmy Clark sang the role of Tony. Natalie Wood wasn't entirely believable as a Puerto Rican, and Richard Beymer’s performance lacked spark. 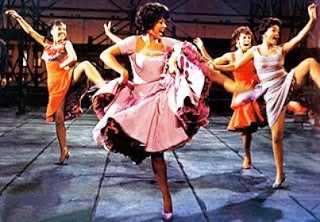 Certainly the performances of Rita Moreno as Anita and George Chakiris as Bernardo were so powerful as to outshine everything else. Chakiris’ performance went beyond mere generalized anger to a sense that Bernardo had collected every slight, every name he was called, every missed opportunity into a very specific sense of self and his place in opposition to the rest of “American” New York City. Moreno brilliantly walked the tightrope between mature woman with no illusions and American optimist. Her tour de force number is “America,” in which she counters every complaint about her new country. Anita so desperately wants everything to work out in America that her later admission that “Nardo was right” is just devastating. The other problematic aspect of West Side Story in film is the supposedly deadly street toughs periodically breaking into song and dance. On stage, there is an expectation of stylized performance, but film is usually meant to be more “realistic.” Having a film cast with dancers though provides certain benefits. The physicality of the actors is as evident as in any action film. When they run, they are running flat out. They actually climb chain link fences and walls, and Russ Tamblyn actually performs those flips. The sweat and grime is real. When Ice spins on his knees in “Cool,” the knees of his pants come up dirty. The fight choreography is no more stylized than any kung fu film, where actors fight endlessly with no injury or effort. The boy-meets-girl story is timeless, but so it seems is the issue of immigration as a hot topic in the United States. Recent restrictive legislation hinges on the question of “legality” or “illegality,” but the actual process of enforcement relies on an individual’s appearance. In addition, the “land of opportunity” has growing income inequality. When Anita sings, “you can be anything you choose,” but Bernardo retorts, “waiting on tables or shine shoes,” it still has resonance today. Bernardo’s is a hard lesson, because those with the most faith — Anita with her faith in America, and Maria, with her faith in love — lose those they love. It is not the usual musical happy ending, although Maria/Juliet survives in this version. In a scene that redeems Natalie Wood’s performance for me, Maria confronts both gangs over Tony’s dead body. She seems to have aged years in a moment, because “widowed,” she has gained the experience of a much older woman. “How many bullets are there?” she asks them. “Enough for you? And you?” Considering America today, the more things change, the more they stay the same. Being a Sondheim fanatic, the songs are what do it for me and I try to overlook the acting. (I actually am not a fan of Chakiris either, but love Moreno and Tamblyn.) I just have to pretend some of the really painfully bad parts don't happen such as when Doc comes out and goes, "Why do you kids kill?" Plus Robbins' choreography is great. I can't believe you didn't mention Beymer and Tamblyn's reunion nearly 30 years later as Ben Horne and Dr. Jacoby on Twin Peaks. Beymer may have been stiff as a board as Tony, but he was great decades later as Ben. Good point about Tamblyn and Beymer in Twin Peaks-didn't want to go too far afield. Agreed, the musical numbers drive everything forward like a tsunami. If a tsunami were a good thing. Another nota bene: the play was originally going to be East Side Story and be about an Irish American Roman Catholic family and a Jewish family.